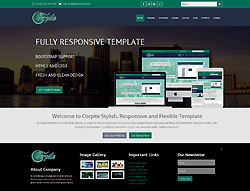 Corpite - Responsive Corporate Joomla Template website template with product showcase. You can use it for portfolio sites, business, corporate, product catalogue, online marketing or services websites.Joomla template is a custom design, clean and modern and comes with many features to help you to built your corporate business related product sites. Our latest template has some interesting features like LESS, Bootstrap, New mobile menu, Smart color manager, Creative testimonial grid, Eight preset styles. Corpite is a responsive joomla template also comes with K2 Component, SP Portfolio, ET Slideshow, Custom Modules, Monialsfader. You can get a fully readymade business template to build your own website with no trouble. Lets download it and build an outstanding corporate business template with our Corpite!